-- For your TIFF coverage needs: Cinema Scope magazine; David Hudson's Keyframe Daily; MUBI Notebook; and Blake Williams' TIFF super-post. Also: David Bordwell's account of attending industry and filmmaker panels at the festival. -- Great amounts of reading: new issues of Screening the Past (helpfully rounded up by Catherine Grant); Cinema Scope; Film Comment; Senses of Cinema; Screen Machine; and World Picture. 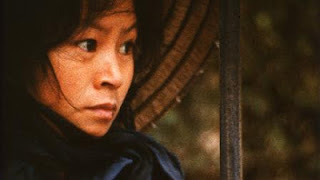 -- Far From Vietnam (1967), the single best film I encountered at TIFF, is notoriously hard to see. I knew this going in, resolved to take notes to keep the film in my memory, then got caught up in its riveting, heterogeneous images and quick pace. And so I'm glad to discover Thomas Waugh's visual essay at Jump Cut that brings the images back to me. -- Jonathan Rosenbaum on Ray Carney in a 2001 piece for Cineaste which reviewed five books on John Cassavetes: "...no critical monopoly can ever be healthy, no matter how conscientious, thoughtful, or thorough the monopolist." -- At Art of the Title: an interesting interview-post with video clips on the title sequences of David Fincher's films. -- Several recent reviews by Ignatiy Vishnevetsky at MUBI. -- Mark Le Fanu on Boris Barnet at the BFI website. -- Phil Coldiron's piece at Moving Image Source: "Shooting on 16-millimeter in a digital age". -- Andrew Klevan and Alex Clayton respond to a negative review by Warren Buckland of their film criticism essay collection. Buckland's review is unavailable to read for free online. -- An essay on cinephilia by Sam Roggen at the Belgian website Photogénie. -- An interview with Brian De Palma on "the art, the technology, and the ethics of watching". -- via Matt Zoller Seitz: a blog post comparing the images of Ozu and Edward Hopper. -- At Film International: Gwendolyn Audrey Foster on capitalism, gluttony, hoarding, waste, excess consumption and film. -- Just discovered This Long Century, a fascinating website that collects, from artists, authors, filmmakers, musicians, etc., "such intimate work as sketchbooks, personal memorabilia, annotated typescripts, short essays, home movies and near impossible to find archival work." pic: Far from Vietnam (1967).